Don’t forget to take advantage of our amazing second pair discount. 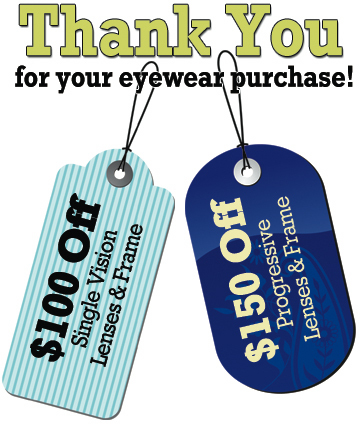 Purchase a new frame with lenses and receive a major discount off of any additional pair of frame and lenses. Computer glasses with blue-light protecting glare-coating. Back-up pair incase of emergency. Safety glasses for work or projects around the house. If you can’t safely drive without your glasses, you need to have a back-up pair. Second pair purchase must be made within 30 days of initial purchase. Some discount insurance plans (i.e. : VSP or First Choice) may not be used to pay for the second pair. The amount of discount is based on the lens design. In most cases, discount is applied to the least expensive lens design. Multiple pairs are for the same patient, but may be ordered in different lens styles (i.e. : Distance, computer, single vision readers). May not be combined with other discounts, sales or promotional packages. Eyewear frame purchases are required. Patient’s wanting to use their own frame are not eligible for this discount.